J. Michael Hardin has been appointed as Samford University’s new provost, effective July 1. The announcement was made May 1 by Samford President Andrew Westmoreland. Hardin currently serves as dean of the Culverhouse College of Commerce at the University of Alabama, Tuscaloosa, and will replace J. Bradley Creed, Samford’s provost since 2002. Creed will become president of Campbell University in North Carolina on July 1. In addition to his administrative duties as chief academic officer, Hardin will be professor of quantitative analysis in Samford’s Brock School of Business. At Alabama, he serves as Russell Professor of Business and a professor of statistics, and he also is an adjunct professor of biostatistics in the School of Public Health at the University of Alabama at Birmingham. Hardin’s appointment follows a national search that yielded more than 100 candidates. He was involved in several interviews with a 19-member, university-wide search committee and two days of on-campus visits with university leadership and representatives of various constituency groups. “The Provost Search Committee is impressed with Dr. Hardin's wide range of intellectual interests, his academic credentials and his administrative experience,” said search committee chair Dennis Sansom. Sansom is chair of Samford’s philosophy department. Hardin brings a diversity of experience to Samford, Westmoreland noted, in addition to his academic administrative experience. He often serves as a consultant to health-care organizations in data analysis, sampling and program integrity. He is a prolific writer and guest speaker in the areas of database design and decision support systems, and he is an ordained Baptist minister. 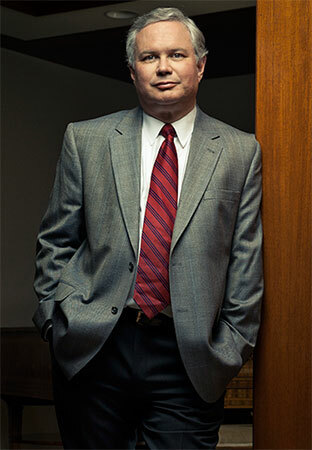 Hardin has been Culverhouse dean since 2011 and was an associate dean from 2007 to 2011. He oversees a college with a $50 million annual budget, more than 8,000 undergraduate and graduate students, and a 135-member faculty. Earlier he was a faculty member in several areas at the University of Alabama at Birmingham and was a visiting professor at Trinity College, Dublin, Ireland. He earned his doctorate in 1985 from the University of Alabama, where he also completed a master of arts degree in mathematics. Additionally, he has bachelor’s degrees in mathematics and philosophy from the University of West Florida in Pensacola, a master’s degree in research design and statistics from Florida State University, and a master of divinity degree from New Orleans Baptist Theological Seminary. "In accepting this assignment, Dr. Hardin brings to Samford a wealth of experience in higher education, an innate appreciation for our mission, genuine affection for the time-honored role of faculty, and an understanding that we are all here to shape and provide a superior education for our students,” Westmoreland added. “I am eager to welcome Dr. Hardin to the campus. I also offer my thanks to Dr. Sansom and all who worked with him throughout this process." Earlier Friday, Hardin announced his retirement from the University of Alabama system and the deanship at Culverhouse.